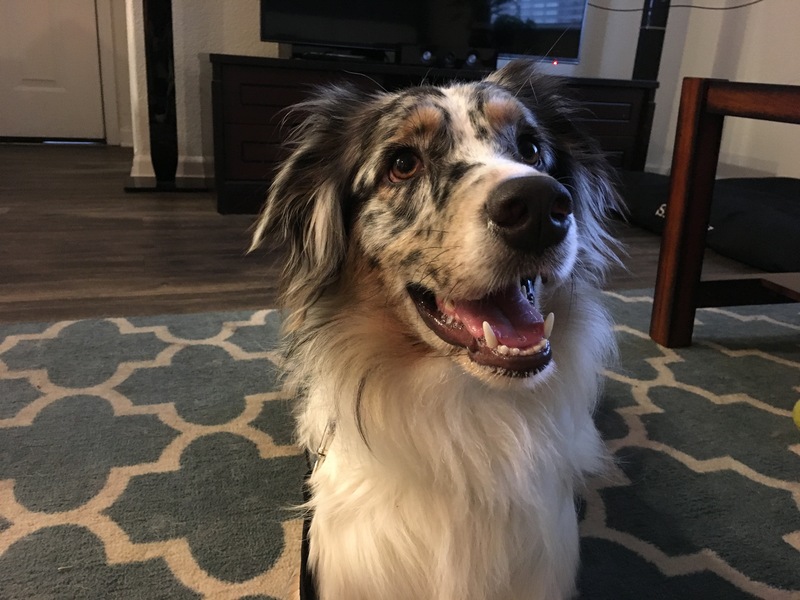 Skippy is a male one-year-old Australian Shepherd Border Collie mix in San Diego who is getting progressively more aggressive towards some guests and dogs both in the house and when out on walks. As soon as Skippy’s guardians tried to open the door, I instantly knew that this dog had some real aggression issues. As you can see in the above video, I attempted to use high-value treats to create a positive association along with non confrontational body language and a few other tricks. While Skippy took the treats, it did not calm him down or generate the positive association I was hoping for. I had the guardians place the dog on a leash and then sit on the other side of the coffee table so that we could discuss the situation. Originally I was considering the possibility that the dog was possessive of his guardians. While there may be some possessive behavior is going on here, the fact that the dog is able to go to other locations without showing this aggressive behavior indicates to me that the issue is primarily territorial. Being a dog who comes from herding lines, it’s natural for Skippy to think that his job should be security or correcting. When dogs live together in a pack, security is generally handled by the senior ranking dog. I probed a bit as I chatted with his guardians and found out that Skippy really didn’t have many rules that he was expected to follow. This can easily confuse a dog into thinking that they have more rank or authority amongst humans than they actually do. Rules, boundaries and structure are very important to dogs from herding lines because they are bred to be independent thinkers. So in Skippy’s case the lack of rules and structure was really a double whammy. I suggested that the guardians start to incorporate some rules and limits to help the dog start to see and identify himself as being in more of a follower position. As we were having this discussion I noticed that the guardian was attempting to pet Skippy to calm him down or relax him. While this is a natural act for humans, using this same psychology on dogs actually reinforces the behavior or state of mind that the dog is in when you provide the affection. To help the guardians start reconditioning how the dog sees that identifies himself authority wise, I went over a technique that I like to call petting with a purpose. Asking the dog to assume a more subordinate position before his guardians provide him with any attention or affection will go a long ways towards helping Skippy adopt a follower’s mindset. But because Skippy’s aggression was directed towards people outside of his immediate family, petting with a purpose is not going to solve all of his issues. I spent the next few minutes going over at some new ways for the dog’s guardian to communicate and disagree with him when he engages in unwanted actions or behaviors. Because these nonverbal communication cues were derived from how dogs communicate with one another, Skippy should pick up on them right away. If the guardians practice using these techniques for the next week or two, it will become second nature to them. Skippy’s guardians had hired a few dog trainers to assist with his behavioral issues with limited success. In fact I believe the dog bit the last trainer that they hired. While dog trainers are well-versed at teaching a dog to engage in specific commands or tricks, the teaching methods employed or not usually very effective in curbing unwanted behaviors. One thing that the last trainer did suggest was the use of a muzzle. Unfortunately she did not provide Skippy’s guardians with much guidance or instruction when it came to introducing the muzzle to the dog. A muzzle is obviously a very constricting accessory. If not introduced the right way it’s easy for a dog to adopt a negative association with it. I spent the next few minutes going over how the guardians can change the dog’s perception of this muzzle. It will be important for Skippy’s guardians to get him a basket muzzle as the one they are using should not be used when a dog is overexcited or during strenuous activities as it prevents the dog from breathing through its mouth. By preventing the dog from opening its mouth, the only way the dog can take in fresh air is through their nose. If used during an athletic activity, this can be dangerous for the dog. A basket muzzle is the preferred option when working with a dog who is excited or engaging in athletic activities. But because we only had the fabric / snout muzzle and needed to have one on the dog, I waited for Skippy to return to a calm state of mind before we did any additional work. Once Skippy was calm and balanced again, I walked his guardians through a leadership exercise that I developed that will help the dog get used to following the lead of his guardians. By the time that we had concluded the leadership exercise, Skippy seemed very calm and comfortable. I knew that one of his triggers was movement, so I took a seat on the couch and then had his guardians remove the muzzle while I remained sitting and still. If the new structure and changes to the leader follower dynamic introduced in the session don’t completely stop Skippy’s aggressive behavior towards strangers, the next step will be counterconditioning. In order to use this technique, Skippy’s guardians will need to enlist the help of a friend or have me return for a follow up session. After returning the dog to a calm and balanced frame of mind, I would have their guardians across the room with the dog on a leash and access to a large bag of high value treats. The next step would be a very methodical process of dropping treats immediately as or before I the person Skippy would react to made any moves. At first it would be simply leaning forward. Usually dogs start to react when they realize something is about to happen. This occurs as the dog reacts to the movements that precede the actual movement. In this case, leaning forward is the step that leads to a human about to get up. The guardian would drop a treat at Skippy’s feet or pop it into his mouth while the person helping leans forward simultaneously. By practicing this step over and over until the dog no longer shows anticipation or excitement with the leaning movement, only then is the dog ready to take the next step (such as the helper placing hands on the sofa as if they are about to push down on the soft as they stand up). This technique can involve giving the dog the treat right before the helper moves or at the same time. If the dog ignores the treat once the person moves, then the guardians should give the dog the treat first, then have the helper person move right after as the dog chews. If the dog still reacts, increasing the distance between the helped and the dog can help. Other tips would be to take Skippy for a long walk or game of fetch first so he isn’t full of energy. By repeating this process of delivering to treat before or at the same time the human makes a movement, and practicing that until the dog no longer reacts, the guardian will be able to countercondition the dog into a new behavior. This occurs because the dog starts to associate a person moving about as the same thing as getting a tasty treat. But in order to work, the guardians will need to break down the helper’s movements into individual steps and practice each one until the dog is calm and relaxed throughout before moving on to the next step. By the end of the session, I could see a difference in Skippy’s guardians. They were watching the dog for signs of aggression before they actually happened. This is an important part of rehabilitating an aggressive dog. As the dog starts to see and identify as being in the follower position, its possible that the territorial aggression will abate. But if that isn’t the case, a follow up session to orchestrate a methodical regimen of counterconditioning will be the next step.